Two Russian physicists are fundraising to realize their project for wireless energy transmission once proposed by brilliant 20th-century scientist Nikola Tesla. Solar panels and an upgraded Tesla Tower could solve global energy hunger, they say. Leonid and Sergey Plekhanov, graduates of the Moscow Institute of Physics and Technology, claim they have spent years scrutinizing the Nikola Tesla’s patents and diaries and they believe that with his most ambitious project – transcontinental wireless energy transmissions – Tesla came very close to unprecedented scientific discovery that could be brought to fruition. The enthusiasts say they need about $800,000 to reconstruct the famous Wardenclyffe Tower once created by Tesla himself to implement his ideas and find a commercial application for his ideas on long-distance wireless energy transmission. The Plekhanov brothers are raising money through IndieGogo kickstarter. The campaign will last until July 25. So far the project has managed to collect only 2 percent of the desired sum (about $18,000 out of the desired $800,000 as we publish this article). According to the authors of the project, as of today all human civilization’s electric energy needs could be covered with a single installation of solar panel measured approximately 316 by 316 kilometers (100,000 square kilometers altogether) positioned in a desert somewhere near the equator. They believe the only stumbling block to such a project is the delivery of electric energy to final consumers, as the loss of energy directly depends on the distance of transmission. 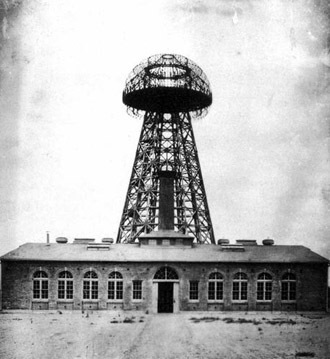 The original Wardenclyffe Tower (also dubbed the “Tesla Tower”), was constructed by Nikola Tesla in Shoreham, about 100 kilometers from New York, in 1901–17. It never became fully operational. The 57-meter-high tower was made of wood and copper and after a number of experiences to perform trans-Atlantic wireless power transmission, as well as commercial broadcasting and wireless telephony, the tower was disassembled in 1917. Leonid and Sergey Plekhanov believe the construction of their “Planetary Energy Transmitter” would be much lighter than that of Tesla’s, decreased from over 60 to mere 2 tons – all because of the modern materials used for the framework and up-to-date conducting materials. Naturally, the installation would be equipped with advanced electronics. “We’ve conducted the fundamental research studies, implemented the computational models and designed all the parts of the experiment. We will be able to perform energy transmission and measure the results. Will it be ‘global’ as Tesla suggested? Based on the research that we’ve already done – we believe it will be, and we going to prove it experimentally,” the scientists wrote. The scientists are going to repeat Tesla’s experiment in the fall of 2014. And if the experiment works, the scientists say that a free energy world with limitless global energy transmission is possible. Still, there are a number of considerations regarding the huge solar panel installation proposed by the Plekhanovs. Besides the fact that the very production of solar panels, at least on the modern level of technology, is really damaging for the environment, the efficiency of such power generation is still very low. Besides that, such production is very expensive. A square meter of solar panel costs approximately $200. A simple multiplication of the sum by the proposed 100,000 square kilometers give us a stunning sum of $20 trillion, more than the gross GDP of either the US or EU. That’s without infrastructure. And even if the cost of production falls by several times, it would still be unspeakably expensive, experts say.